Competitive, cost-effective fiber optic component manufacturing calls for accurate power measurements that can be easily repeated. For reliable comparison, the FPM-8210 and FPM-8210H Fiber Optic Power Meters have a single input port for both connectorized and bare fiber measurements. Virtually insensitive to polarization state or to pattern changes from fiber orientation, these meters deliver repeatable high resolution results. ILX Lightwave engineered the FPM-8210 and the FPM- 8210H for your production test workstation. The innovative fiber optic head design makes reliable fiber endface positioning a routine task, whether or not the fiber has a connector. 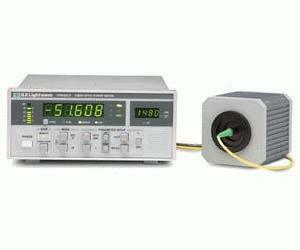 With the CA-120 Bare Fiber Adapter, these meters are compatible with either ILX Lightwave or Agilent bare fiber holders. The FPM-8210 and FPM-8210H Fiber Optic Power Meters are the factory measurement tools to drive down your component PDL specifi cations while increasing test throughput.